Princess cut engagement rings feature a square brilliant cut diamond, housed within a ring setting. Princess cut diamonds remain the second most popular diamond shape. The word Princess denotes the shape, brilliant faceted with four pointed corners. Each corner is typically held within a prong, rounded or angled to retain the diamond. Our fabulous collection includes a range of personal choices—from the traditional to the modern classic. We craft each ring with a perfect finish, beautifully boxed—finally hand-delivered by secure courier to your door. We include all tax and duties worldwide before payment for your ultimate reassurance and ease of purchase. The Aurora Princess cut engagement ring defines the modern solitaire ring, with a simple Tiffany style setting. A simple band tapers towards a secure setting with a square brilliant faceted diamond, available in a wide choice of specifications. Sleek lines and a wonderfully simple Tiffany inspired 4 claw setting. Open setting allows full view of the diamonds allow light to flood through the stone. Substantial high quality ring mount which narrows at setting, with court profile. Please allow 3-4 weeks for completion in your chosen options. Most options include full GIA, IGI or HRD certification. Sensational ultramodern and stylish fully bezel set engagement ring surrounding a glimmering princess cut diamond of your choosing. Bezel setting, Bevelled edge design, Flat profile band. Band widens at setting, Available in 18ct White Gold, 18ct Yellow Gold, 950 Palladium and 950 Platinum. Wood boxed, gift packaged. Approx. 14 working days delivery. Glimmering princess cut diamond solitaire, with 4 pointed claws aligned north east south west, featuring plain knife edged shoulders. Princess cut diamond, Four Claw Setting, North-East-South-West Oriented, Box Claws, Solid tapering shoulders. Available in 18ct White Gold, 18ct Yellow Gold, 950 Palladium and 950 Platinum. Wood boxed, gift packaged. Approx. 14 working days delivery. Beautiful, wedding ring friendly princess cut solitaire engagement ring with squared 4 claw setting. Unique design allows perfect fit for wedding ring . Four box claws protect diamond. Classic timeless styling. Solid tapering shoulders. Available in 18ct Yellow Gold, 18ct White Gold 950 Platinum and 950 Palladium. Wood boxed and gift packaged, 14 working days delivery. A Wedfit 4 prong princess cut diamond solitaire engagement ring with four prong design and tapering shoulders. Beautiful slim shouldered, wedding ring friendly design. Set with your exact choice of princess cut diamonds. Four rounded claws support the elegant brilliance of the square diamond. Slender open tapering shoulders. Please allow 3-4 weeks for delivery on this made-to-order item. Most options include full certification and insurance valuation. A Princess cut diamond engagement ring with modern tension style setting. Modern and simple princess cut diamond tension set engagement ring with low profile setting. An uncomplicated yet precision set, sleek design which follows the ring width. Setting remains open allowing light through each side. A comfort fit court profile band is included in this simple, elegant and contemporary design. Wood boxed and gift packaged. Approx. 3 weeks for delivery. Modern princess cut diamond solitaire engagement ring tension set between tapering solid shoulders within a crossover design. Sleek, ultramodern engagement ring design with a princess cut diamond. Held between crossover shoulders select any one of the many diamond options for this contemporary design available in a range of metal choices created to order. Please allow around 3-4 weeks for completion. Most diamond options include full certification. Wood boxed and gift packaged. Deceptively simple, iconic 4 claw princess diamond solitaire engagement ring design featuring solid tapering shoulders below an exceptional princess cut diamond. Most of our engagement ring designs are created around your chosen diamond, meticulously crafted to ensure a perfect finish every time. This iconic diamond solitaire is a timeless classic with a modern feel, created with sleek tapering solid shoulders and a simple diamond setting. Please allow around 3-4 weeks for completion. Beautifully presented as shown. Traditional 4 claw diamond engagement ring with classic squared 4 claw setting and tapering court profile shoulders. Amongst the many traditional designs, a classic squared claw setting frames the princess cut diamond in this favourite princess cut solitaire design. Includes tapering shoulders and a court ring profile. Timescale approx. 3-4 weeks. Floating on a simple band, this wonderfully modern, full bezel setting frames the princess cut diamond, with the ease of a seamless wedding ring friendly design. A full bezel floats over a modern simply styled bezel setting. From the lower part of the setting, the pavilion of the square princess cut diamond is clearly seen, allowing light to freely pass through the diamond. The band can be provided with a contemporary matte finish to contrast with the bezel for a designer look if required, but mirror polished as standard. Larger princess diamonds look breathtaking in this modern engagement ring design. A 4 claw Lucida styled setting with crossover prongs featuring squared box claw settings to secure and protect a square princess cut diamond. Lucida style setting. Four box claws. Tapering shoulders. Court ring profile. Supplied in 18ct White Gold, 18ct Yellow Gold, 950 Palladium and 950 Platinum. Wood boxed, gift packaged, 14 working days delivery. Platinum 4 claw Olympia design, solitaire engagement ring set with a princess cut diamond within an exceptional cathedral setting. Beautifully styled 4 claw princess cut diamond engagement ring. 950 Platinum with an elegant simple cathedral setting above flat profile shoulders. We invite you to choose your perfect diamond specifications for this exceptional princess diamond solitaire ring. Please allow around 3-4 weeks for completion. Most diamond options include full diamond certification. GIA and IGI laboratories typically. A contemporary square Princess cut diamond solitiare engagement ring with four box claw setting. Square Princess cut diamond, Four box claws, Swan neck setting, D shaped profile, Box Claws, Elegant simple design. Available in 18ct White Gold, 18ct Yellow Gold, 950 Palladium and 950 Platinum. Wood boxed, gift packaged. Approx. 14 working days delivery. Ivy captures the beauty of a perfect princess cut diamond, held within a substantial, beautifully crafted four claw setting above a comfort fit band. 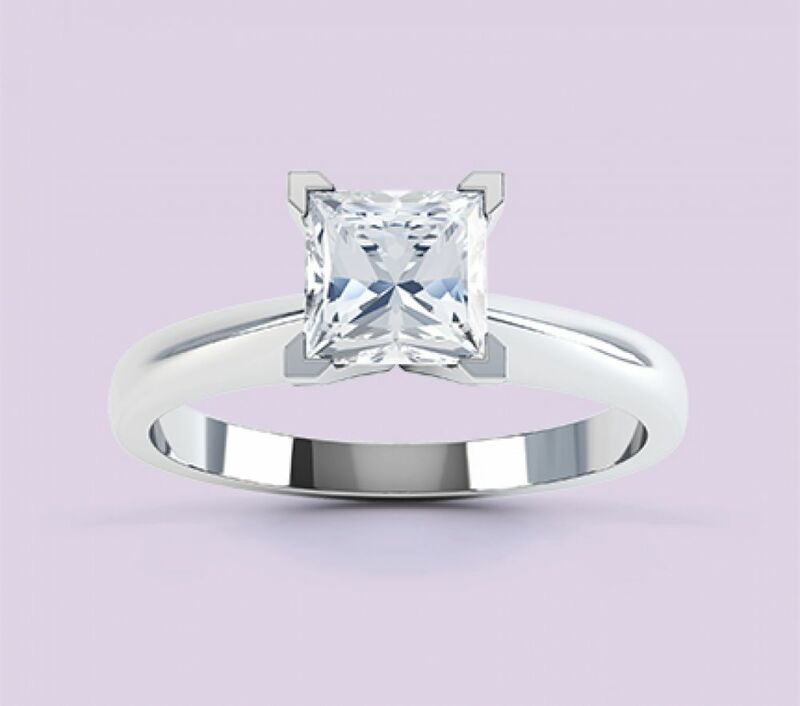 A traditional princess cut diamond engagement ring, which suits larger diamond sizes owing to the wider more substantial shoulders of the ring, nearing 3mm wide. Both shoulders taper towards the setting which has 4 claws and a supporting under-bezel. 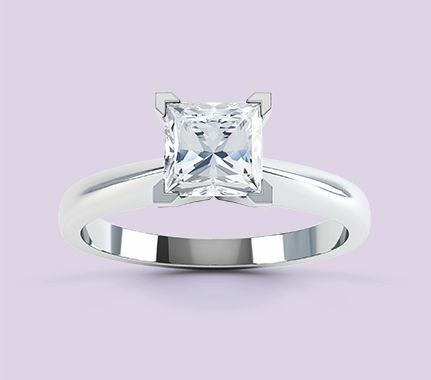 A simple, and classic square princess cut designs, which has remained a favourite over many years. A classic princess cut diamond engagement ring with high 4 prong setting and supporting under-bezel. Four claws, Simple design to display diamond, Solid tapering shoulders, D shape profile, Choice of diamond weights. Available in 18ct White Gold, 18ct Yellow Gold, 950 Palladium and 950 Platinum. Wood boxed, gift packaged. Approx. 14 working days delivery. The Ignis design stands for fire and scintillation. Set into a delightful Tiffany inspired setting, this four claw Princess cut engagement ring retails simplicity and elegance. Your chosen diamond will be selected with square proportions and set side-ways aligned north-east-south-west in a compass styled 4 claw setting. Supportive claws allow an open setting which allows light to pass through the diamond above beautifully tapering shoulders. Comfort fit court profile band. Please allow 3-4 weeks. Most diamond options are fully certified. Insurance valuation included with any diamond ring purchase. An exceptional princess cut diamond solitaire engagement ring featuring channel set diamond shoulders in a simple, elegant design with classic looks and styling. Exceptionally pretty Princess cut engagement ring design, created with your chosen metal and diamond options. We match the additional 0.25cts of channel set diamond shoulders - 5 x 1.5mm diamonds either side of your centre stone, elegantly held in a modern 4 claw setting. 2.5mm ring width. Please allow around 3-4 weeks for completion. Packaged as shown in our example below. Modern classic Lucida styled setting with your chosen princess cut diamond held within a contemporary 4 claw trellis setting. Make your choice for both the metal choice and your diamond options. Your princess cut diamond is set into this elegant Lucida styled setting, with sweeping claws, best appreciated from the side view below. Straight shoulders compliment the simplicity of the modern classic design. Please allow around 3 weeks for delivery of this design. Packaged as shown in our animation below. Pick your favourite princess diamond size, colour and clarity for an exceptionally modern, simple bar set solitaire ring design. Contemporary design. Tension style bar setting. Straight 3.3mm shoulders. Flat ring profile. Available in 18ct Yellow Gold, 18ct White Gold 950 Platinum and 950 Palladium. Wood boxed & Gift packaged. 14 working days delivery. Breathtaking bar set princess cut diamond ring, with 0.40 carats of additional diamonds channel set into each shoulder. In addition to any diamond you choose for this stylish princess cut diamond ring, we add an extra 0.40 carats to the weight, across the channel set shoulders. With a perfect finish, your diamond will be bar set between matching outer diamonds. Timescale is typically 5-6 weeks, but wait until you see the finished breathtaking ring. Wood boxed and shipped fully insured. Includes diamond certification. (Typically GIA, IGI or HRD certified). Modern, charming princess cut diamond solitaire engagement ring with squared bezel setting complimenting the square lines of your chosen diamond. An individual and modern solitaire engagement ring design. Set with any one of many diamond options, a part bezel squared setting protects each corner of a beautifully cut princess diamond. A comfortable court profile band, widens gracefully towards the setting in this accomplished ring style. Please allow 3-4 weeks for manufacture. Most options fully certified including insurance valuation and shipped fully insured. A popular 4 claw Princess cut diamond solitaire engagement ring with court profile band and narrow tapering shoulders with low setting. A very popular, modern ring design ideal for an engagement ring. Sitting fairly low at a very sensible height from the finger, the ring design has gently tapering shoulders which narrow towards the 4 right-angled claws which protectively hold each point of the diamond. There are many options provided for the diamond, and each ring is delivered beautifully presented in around 3-4 weeks. A four claw Princess cut diamond solitaire engagement ring with a low setting, featuring a square box style 4 claw setting. Modern, simple square princess cut diamond engagement ring, featuring a squared setting, with box claws protecting each point of the princess cut diamond. Tapering shoulders compliment the clean simplicity of this contemporary style. Open setting allows light through the diamond. Typical timescale for completion around 3-4 weeks. A Princess cut diamond solitaire engagement ring with a fluted, fine, full bezel setting and narrow tapering shoulders. Following the outer edge of your selected diamond, the fine bezel setting defines the square shape of the princess cut diamond. The setting itself is fluted and adjoins each open shoulder with simple elegant detailing. The court profile band has a fine 2mm width making this a delicate graceful princess cut solitaire design. Please allow 3-4 weeks. Wood boxed and gift packaged. Delightfully simple, the Florence Princess diamond twist engagement ring features a compass oriented square diamond, brilliantly faceted and styled within a four claw twist setting with a comfortable court shaped band, ideal for daily wear. Modern classic princess cut diamond twist engagement ring with a 4 claw twisted setting and squared claws. This design is simple, stylish and remains a favourite, with a marvellously simple, 4 claw setting oriented north east south west. The ring also features a very comfortable court profile band which tapers and flows beautifully into the setting itself. Please allow 3-4 weeks for completion. Beautifully presented as shown in our example animation below. Simple 4 claw princess cut diamond solitaire engagement ring with modern, squared simple setting and straight solid shoulders. Very simple, modern 4 claw setting with squared box claws around your square princess cut diamond. This design has an un-fussy sleek appearance, with a sensible diamond height for everyday wear. Court profile band with side wall. Please allow 3-4 weeks for completion and delivery. Most diamond options include certification and a detailed insurance valuation is supplied with the finished ring. Wood boxed and beautifully presented. The Grace diamond engagement ring accentuates any Princess cut diamond with a modern four claw setting. Slim tapering shoulders flow from a comfortable court shaped band to create a truly modern ring design. The slim tapering shoulders of the Grace engagement ring perfectly make this a favourite setting, suitable for round and princess cut diamonds. 4 rounded claws secure the diamond, above a deep D-shaped engagement ring band which gradually reduces and becomes slimmer at the shoulders. This design works emphasises lower carat weights perfectly and comes wood boxed within approx. 3-4 weeks. Simple 4 claw princess cut, square diamond engagement ring with capped claws over each diamond point above a comfortable band. A very simple 4 claw ring design, with small claws capping each corner of your chosen princess cut diamond. The band has a narrowing, comfortable band. The design is a very simple yet modern solitaire creation we typically create in around 3-4 weeks, including a diamond grading report (certificate) with most diamond choices. A square Princess cut diamond engagement ring with four box-claw setting with twist design and classic court profile tapering shoulders. Set squarely, this 4 claw twist diamond engagement ring features a princess cut diamond of your choosing. Protective squared box claws protect each corner of the diamond above twist style shoulders with a court profile band. A lovely simple square princess cut ring design. Please allow 3-4 weeks for delivery. Most diamond options include full certification from GIA and IGI typically. A simple four claw diamond engagement ring with fold-back box claws securing a Princess cut diamond. Four claws securely hold diamond, Stylish design, Court ring profile, Choice of diamond weights. Available in 18ct White Gold, 18ct Yellow Gold, 950 Palladium and 950 Platinum. Wood boxed, gift packaged. Approx. 14 working days delivery. Princess cut diamond rings embrace a brilliantly faceted square diamond, typically secured within a four claw setting. Each prong or claw secures the diamond at each corner with a variety of settings available. Alternative engagement ring styles include the bezel setting. This technique surrounds the entire diamond with an edge of polished metal. Princess cut engagement rings are sometimes confused with the Princess Diana engagement ring, an entirely different cluster design featuring a blue sapphire surrounded by white diamonds. You will no doubt see that the Serendipity Diamonds collection houses many styles. Some designs have thick bands, others thin bands, contrasting with a full choice of diamond sizes, from small diamonds to larger 1 carat Princess cut diamonds. Some Princess cut diamond engagement rings have side stones, or diamond shoulders, whilst others within our collection feature a halo of round stones surrounding the main diamond. If you are looking for trilogy, or 3 stone Princess cut engagement rings, ensure you visit our main three stone diamond ring styles online. Contact a member of our team for expert help on both diamonds and precious metals, including Platinum, White Gold, Yellow Gold, Rose Gold and Palladium. We also provide Fairtrade Gold for most of our Princess cut engagement ring designs.